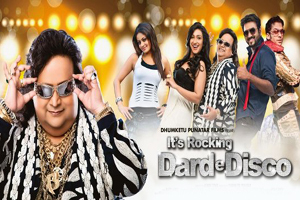 It's Rocking - Dard-E-Disco is a 2012 musical comedy film directed by Ashok Tyagi and produced by Dhumketu Punatar. The film stars Bappi Lahiri, Akshay Kapoor, Sneha Ullal, Rituparna Sengupta, Aryeman Ramsay, Shakti Kapoor, Sharat Saxena, Asrani, Razzak Khan. The soundtrack of film is composed by Bappi Lahiri, with lyrics penned by Virag Mishra, Sameer, Deepak Sneh. Here is the link of all the songs lyrics and videos of It's Rocking - Dard-E-Disco.